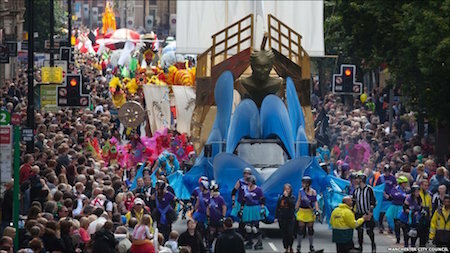 The Manchester Day parade will weave its way through the heart of the city centre in an explosion of colour, music and dance! Manchester Day 2016 promises to be even bigger and better! The centrepiece of the day will still be a stunning parade through the city centre. The parade itself will be around one mile long and take up to an hour to pass any one point!